Topspots (Frontline Plus, Advantage, Advocate, Advantix and Revolution). 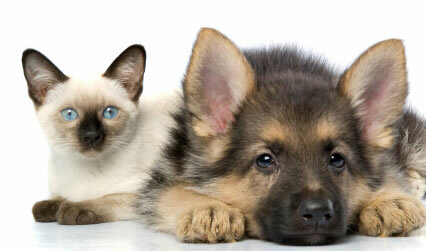 We can discuss with you the best combination to suit your pets. Treat all dogs and cats in your household. Don’t make the mistake of only treating the pet that is itchy or looks like it has the most fleas because the other pets will be harboring fleas and recontaminating the environment. Don’t miss a dose. Treat at the frequency recommended by the product manufacturer or there will be a breakdown in treatment efficacy. Don’t make the mistake of not treating in winter. Fleas may be less active in cooler months but they still breed. Flea pupae can lay dormant in the ground for months and are impervious to many pesticides, waiting for their opportunity to make a mass resurgence in spring and summer. Regular vacuuming of your home will assist with removal of eggs and stimulate fleas to emerge. The latter may seem contrary to what you want to do, but these fleas have to emerge at some time. If you wait for fleas to build up until the climate suits them, then you are more likely to have flea ‘plagues’. By vacuuming regularly you spread out the release of these dormant fleas. Furthermore, by timing this with when you have recently applied flea control to your pets, the product is likely to be more potent and act faster to kill fleas, having a less noticeable impact on your pets. Regularly wash dog blankets and bedding in hot water (>60°C for 10 minutes). Avoid untreated animals entering your home environment. Reduce environmental sources of flea contamination (e.g. block pet access to under the house, keep moist shady areas free from debris). These are ideal habitats for fleas and maximise their survivability. Avoid regular swimming or washing. Most topical flea control products are water fast, however, dogs which swim regularly will reduce the overall effectiveness of these products. Frontline spray needs to be used every three weeks instead of every 12 weeks. Proban tablets need to be used every second day instead of twice weekly. Also don’t be mistaken in assuming that all flea products are able to control ticks. Other popular flea products like Advantage, Advocate and Revolution do not have any effect on ticks. It is important to stress that no tick control product is 100% effective. Always double check you pets by systematically feeling through their coat every day. This can be made easier if long haired breeds are clipped. The only products which is registered to help control ticks in cats is Frontline spray (NOT Frontline Plus topspot!!) and Fido’s free-itch rinse concentrate. Fido’s free-itch rinse concentrate will only prevent attachment of ticks for up to three days. While Proban tablets have no claim to prevent tick paralysis in cats, there are anecdotal reports that they are helpful and certainly easier to administer than Frontline Spray and regular bathing with Fido’s free-itch rinse concentrate.